Unit Public Affairs Representative Staff Cadet.” src=”http://www.infocusmagazine.ca/wp-content/uploads/2015/09/Cadets-CCO-CCFTC2015-2100-0019-602×451.jpg” width=”602″ height=”451″ /> Cadet flying over the Comox Valley with his instructor as part of his training at Comox Cadet Flying Training Centre. Photo by Flight Sergeant Nicole Tupy, Unit Public Affairs Representative Staff Cadet. Most of us have seen and heard them as they’ve soared overhead our Valley during the warmer months. No, I’m not referring to a migrating avian species—I’m referring to the tow planes and gliders that share our skies throughout the late spring and summer. Some residents see them as a noise nuisance, but to the glider students and the other folks involved with the air cadet glider program at 19 Wing Comox, the gliders soaring above are something we should be proud of. Recently, I was able to visit 19 Wing Comox and learn about the air cadet program. During my visit I enjoyed meeting and talking to three young air cadets, Cadet Daniel Niles, Cadet Jack Gilfillan, and Cadet Caitlyn Lam, as well as Captain Steve Green, the lead tow plane pilot—or lead turkey, according to the ball cap he wears. The Royal Canadian Air Cadets is a national co-educational organization for youth aged 12 to 18 years. The Royal Canadian Air Cadets were founded in 1941 and have been a part of the Comox Valley since the early 1970s. 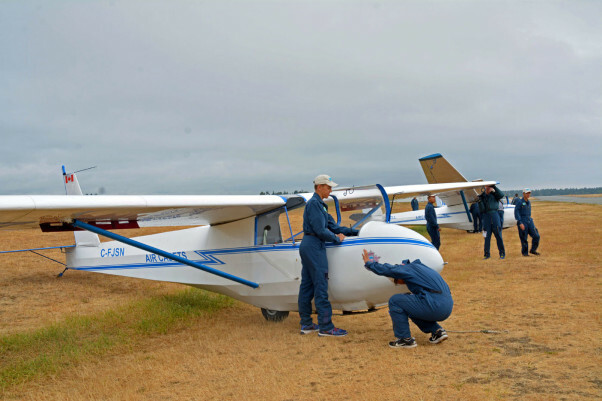 The Comox Valley glider program is unique throughout Canada as the Air Cadet League of Canada only operates five sanctioned air cadet training facilities. The training locations are located in five provinces—Nova Scotia, Quebec, Ontario, Manitoba and British Columbia. Though there are places in British Columbia where air cadets can obtain some air time through familiarization flights, the program at 19 Wing Comox is the only one in BC where air cadets can earn their wings. Though flying is clearly a huge part of what they learn, the mandate of the air cadet program isn’t just about learning to fly. Instead, the first mandate is to develop good citizenship and leadership skills. “The air cadet program is a youth development program, with its primary goals being to develop citizenship, fitness, and stimulate interest in the aviation world, both military and civilian,” says Lieutenant Colonel Keith Stewart, Commanding Officer of the Comox Cadet Flying Training Centre. Though the program is military based, it’s not what one might expect. The program is designed as a way to encourage children and young adults to have confidence in their abilities. According to LCol. Stewart, the cadet program is not used as a way to recruit future members to Canada’s Forces. In fact, the participating air cadets have no requirement to enroll in the military. There aren’t very many 16 year olds who can pilot their own aircraft, but the air cadet glider program presents approximately 320 air cadets with their wings each year, Canada wide. But it takes more than the obvious skills to make this happen. Most notably, the young adults learn to have confidence in what they can achieve on their own. When they fly solo they are 100 per cent responsible for themselves and for the glider. During their solo flights, which last, on average, about 11 minutes, the cadets release the cable that connects them with the towplane, they talk with the tower, get permission to land, and then land the plane on their own. But the graduates do learn to fly and more often than not the experience leads into a future career in aviation. In fact, 63 per cent of today’s commercial pilots in Canada are former air cadets. “I wish to pursue a career in aviation, and this is where it all starts,” says Cadet Gilfillan. “The wings I earn here will be my first wings.” Graduates will receive their Cadet Glider Pilot Wings and Transport Canada’s Glider Pilot Licence. LCol. Stewart was also a cadet. “I was a cadet in 103 Thunderbird Squadron, in North Vancouver. My time spent there helped me to mature and develop leadership skills faster than I would have done otherwise. Membership in cadets presented me with numerous challenges and opportunities that would not have otherwise been available to me, allowing me to grow as a positive contributor to our society at a young age, and set the stage for what has become a lifetime of ‘paying it back’. Glider cadets checking the rope release mechanism on the glider before taking off for a flight at Comox Cadet Flying Training Centre. Photo by Flight Sergeant Nicole Tupy, Unit Public Affairs Representative Staff Cadet. The air cadets must complete 49 flights in total before they are deemed successful. A little more than half of those flights are with an instructor and the rest are piloted only by the cadet. However, by the time their solo flight comes around, they are more than ready. The glider flying itself runs like a well oiled machine—it has to in order to accomplish approximately 3,000 glider launches each year. While three gliders are in the air, there are always two gliders waiting to be pushed onto the runway behind the newly arrived and waiting tow plane. The turn around is incredibly fast, with the wheels of the tow plane touching down and then lifting aloft again, towing a glider, in less than three minutes. And the program is safe. In fact, it’s the safest of all Canadian military operations, with 99.98 per cent of all flights flown without injury or damage to the aircraft. The local air cadet program uses 13 Schweizer 2-33A gliders, which are manufactured in Elmira, New York. The gliders are two seater crafts, made of metal with fabric covering. They only weigh 600 pounds but have a wing span of 51 feet. The program uses six highly modified Cessna 182 Skylanes which support more than 13,000 air cadet flights each year. The new fleet of tow planes became official this past June. From start to finish it took more than 10 years to complete the program, which included fundraising, sourcing the best type of plane, deciding on the necessary modifications, and implementation. There were several exacting requirements for the new aircraft such as a safe towing speed of 60-70 mph, the ability to tow to 10,000 feet above BC’s rugged terrain, the ability to operate from grass runways, and a four-seat capacity. Consideration was also given regarding the airplane’s engine noise and the ease of flight by relatively inexperienced pilots. Sourced and refurbished completely by Vancouver Island companies, the planes are owned by the Air Cadet League of Canada and operated and maintained by the Canadian Department of National Defence. This fleet is unique in the world and the modified Cessna crafts are now known as the Pacific 182. As one would expect, having a program that launches so many flights each day can create some tension with those on the ground. “We have a very significant noise abatement program that changes our flight plans continually,” says Captain Caleigh Conway, the media contact for the air cadet program. “We’ve been tracking noise complaints and when the tower permits us, we always try to alter flight plans so we aren’t flying over the same neighborhood continuously. When possible, we also dial down the engine to reduce noise over certain areas.” Clearly, the noise can’t be completely removed, but those who administer the program are doing all they can to minimize noise pollution. Perhaps Air Cadet Niles puts it best when he describes the benefits of the glider program.